Flextrode Package 4 - BrainMaster Technologies Inc. Consists of a hollow, screwlike plastic retainer containing a felt wrapper that encloses a standard gold cup electrode. They are used with a retaining ring that can be inserted in a headband, hat, or other holder. This provides a simple, clean, self-abrading and self-cleaning, paste-free and gel-free contact. 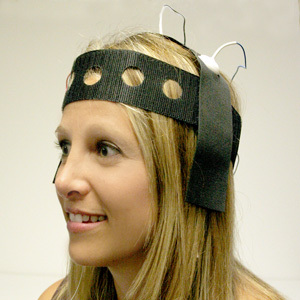 Used for EEG, EMG, EKG and related body potential recording. Ideal in cases where it is difficult to get a good connection, especially through hair. Electrode lead color our choice. Easy to apply and remove. Leaves hair clean without a trace of goo. A must in keeping teenagers and adults happy to come back.